Thick. Heavy. Swinging. That is Double Bass Mania VI. Think Black Sabbath swing but in a modern-sounding drum mix. That’s the attitude here – swinging the heaviness and bringing the doom metal drum loops. All grooves have an undeniable swing that will unleash the most brutal of all triplets. Funeral, epic, doom? That’s the vibe we captured in this drum loop package exclusively for all the doom metal artists out there. For doom, stoner, sludge metal. Sabbath-Inspired Doom Metal Drum Loops. Thick. Heavy. Slamming. Swinging. Swinging? What’s with that? Metal doesn’t swing! Brothers and sisters, yes, it does. 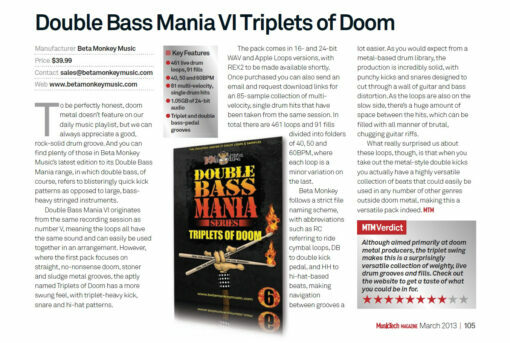 And, that is what Double Bass Mania VI: Triplets of Doom is all about. We again kept these tempos at pure sludge values (40-60 bpm) but this time the heavy and hypnotic doom metal drum loops of DBM6 are all built around triplet feels. Just think Black Sabbath at its swingiest and doomiest, just laying hard into the triplets as the dirge rolls over your face. That’s the vibe we captured in this collections of loops. Doom, stoner, and sludge metal? Yeah, it can swing all the while it can be brutal. With a healthy mix of single kick drum grooves as well as flurries of double bass runs, Double Bass Mania VI: Triplets of Doom will satisfy the urge for heavy drum grooves with space, power, and, yeah, swing. Double Bass Mania VI: Triplets of Doom Metal will inspire you with heavy, ultra-slow and spacious drum loops, a thunderous rhythmic backbone for your nastiest and sludgiest riffs. 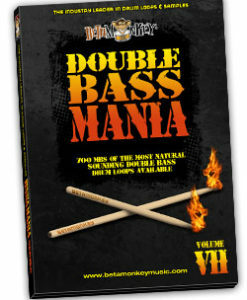 Single kick, double kick grooves, multiple loop variations, drum fills, and a matching drum and cymbal sample set, Double Bass Mania VI swings the sludge and dirge hard. 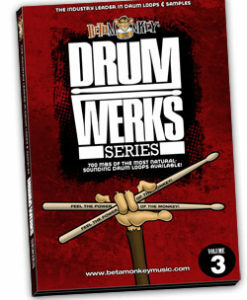 You won’t find metal drum loops like this anywhere (go ahead and look). If you’re delving into classic and modern doom metal, stoner doom, death doom, epic doom, this is the place to start to get new metal drum tracks flowing. Agonizingly slow? Check. Brutally heavy? Check. Swinging with Satan? Well, we’re not going that far. 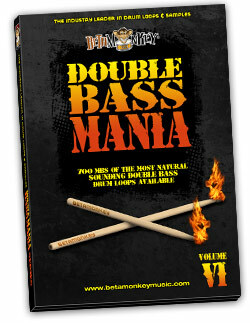 Double Bass Mania VI: Triplets of Doom is the ultimate drum loops package resource for pure metal songwriting inspiration. Designed for Multiple Styles of Doom Metal, from classic Sabbath to modern sludge metal: All grooves are triplet-based feels with pure power and brutality. A solid mix of single and double kick grooves. Crushing, spacious swing feels can be yours with DBM6. Focused Range of Tempos: Ultra slow tempos from 40 BPM to 60 bpm. Triplet-Based 4/4 Feels: All drum feels are triplet based 4/4 time to let it breathe with the Black Sabbath inspired triplet swing dirge feels. If you want straight feels, you want Double Bass Mania V.
Cohesive Drum Sounds: All drum loops are from a single recording session (all loops, fills, and samples are sonically-matched). Change tempos. Change feels. All loops on Double Bass VI are 100% compatible and seamless to integrate together and compatible with Double Bass Mania V.
Fully-Sampled Drum and Cymbal Samples: Complete multi-velocity drum, cymbal samples kit is included (requires separate download). 461 (1.05 GB) original, license-free drum loops and drum/cymbal samples. All loops and samples are available in 16/44, 24/44 WAV, and APPLE (AIFF) format. REX2 format update to follow. 85 (100+ MB) multi-velocity drum and cymbal samples. Includes all drums (kick, snare, toms) used as well as cymbals (crashes, chinas, rides and hi-hats). Available as a separate download after purchase. Double Bass Mania VI Review: Read what MusicTech Magazine had to say about these loops.